Get rides. Give rides. Make money. 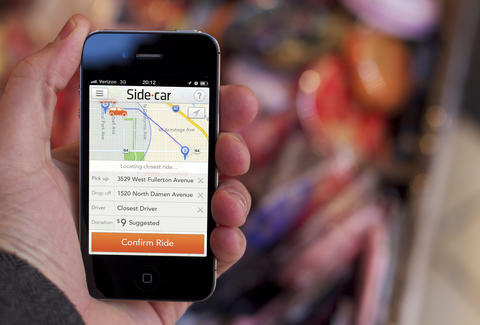 Because Zach Braff is never around when you need him to give you a ride in the literal sidecar on his sweet vintage motorcycle, SideCar's a convenient app here to arrange a ride for you, or help you make a few extra bucks if you're the enterprising type, but not the kind that already owns a rental car franchise. Here's how it works: If you need a lift and there's no 5-hour ENERGY handy, request an "instant rideshare" with your smartphone, then monitor the driver who accepts it coming to get you in real time, or track their progress via text, email, or social media. Prefer to be a driver? After they check you out to make sure you have a safe record/ actual car, you can start earning extra scratch by offering up rides to strangers/ tech-savvy friends who'll be surprised to see you. Payment is voluntary (though there's a suggested donation), and all conducted via phone. It's only avail on Friday and Saturday nights to start, but will expand along with the community of drivers and riders, both of whom you can review through the app. Your comments on Zach's Garden State performance, on the other hand, will have to remain exclusive property of your fanzine.